My cultured marble vanity is from the 70’s, what can I do? Cultured marble is a material that is often used for bathroom vanities, sinks, shower pans and walls. Cultured marble is a blend of marble dust and polyester resin and is a material that has been used for years in bathroom fixtures like vanities. Over time, cultured marble can become scratched, chipped, stained, or just out-dated and in need of an update. Another common problem is cracking that develops around the drain in cultured marble sinks. This is referred to “thermal shock” and results from expansion and contraction after exposure to hot and cold water over time. The good news is that these problems can be repaired and then a new finish applied to give vanities a brand new look! 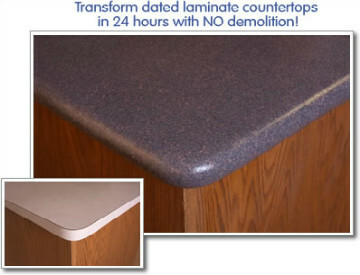 Cultured marble surfaces are excellent candidates for refinishing instead of replacement. Not only will you save money, but there will be no need for removal or expensive replacement, no custom fabrication, and no need to hire a plumber. Additionally, refinishing with Miracle Method extends the life of your cultured marble vanity and sinks and brings its style to the present with updated colors – and all at a fraction of the cost of removal and replacement. Why bother with replacing when you can refinish? If you have an UGLY cultured marble vanity, sink, or other surface, visit our website today to learn more about how the Miracle Method refinishing process can restore its life and style. 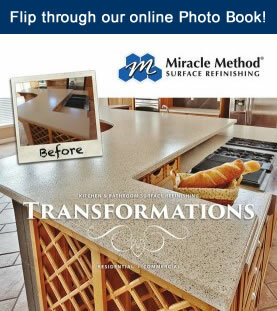 You can use our online locator to find a Miracle Method franchise near you, whom you can contact for an estimate to refinish your cultured marble fixtures.